Chris Coe revisited old haunts and netted in his hometown club’s shirt against another former side as he helped fire the Reds through – and into a massive fourth round tie at current Northern Alliance Champions and Premier League leaders Newcastle Uni. The skilful ex-North Sunderland striker has re-signed at Armstrong Park and came into the Hillmen side for his first start of the season with a number of first team regulars unavailable. 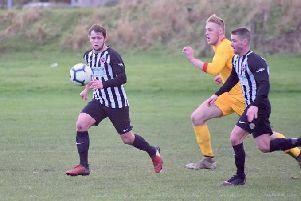 Coe was a huge talent in his first season of North Northumberland League football at Rothbury and got his first taste of the Alliance game when he signed for Spittal with a number of other sides chasing his signature. He dropped back down and claimed a title medal with North Sunderland last season. 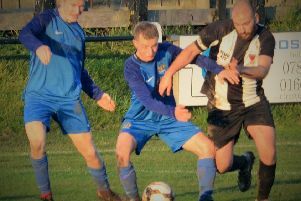 Greg Woodburn was a team-mate of Coe’s throughout junior football who broke into the first team at Rothbury around the same time and was also on target as the Reds weathered a second half barrage to advance. “It’s good to have Chris back in the side as he brings a fresh energy, not to mention his hunger for goals,” said Woodburn. “It was a great game for the neutral with plenty of tackles flying in, but we expect that from Spittal - they thrive on their work rate and determination, and the lads did a great job soaking up all the pressure,” he continued. Rovers piled forward in an attempt to salvage something from the game after the turnaround and the Reds had to dig deep to hold out for the win. “All in all we felt we deserved the victory and we look forward to a tough test against Newcastle Uni in the next round,” said Woodburn. “The lads who came in did great, especially in the first half where our passing showed dominance and we got our rewards. We had to grind out the last half an hour where Spittal had a few chances and Rob made a couple of saves - Sam Proudlock cleared one off the line and they glanced one off the bar too,” he continued. Herron was pleased to see local lads that have come up through the ranks doing well in the side and also praised the huge contribution of the signings that have come in. “Obviously we wish Chris hadn’t left in the first place, but it’s good to have him back in the setup and he’ll push others in the squad for his place after the work rate he showed today. Micky Old was very effective in the challenge up top and won those vital battles for us. Tony Brown was also very good, as always, on the ball and threading through in behind,” he said. Herron also felt that all the pressure was off Rothbury for the visit to the University’s Kimberley Park ground on 22nd December as the Premier Division side are huge favourites.